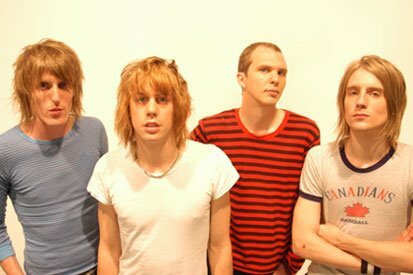 • THE cutting edge brilliance of Razorlight returns to the charts this month, in the form of new single Wire To Wire. The track, the first taste of forthcoming third album Slipway Fires, is an affecting ballad with a hook catchier than flu. You can catch a copy when it hits stores on October 27. • Metal titans Trivium have released their fourth album, the bone-shattering Shogun. The album brilliantly showcases the group’s technical mastery and brutal thrash metal sound. • This’ll cheer you up – New Zealand indie rockers Cut Off Your Hands have released a new EP, Happy As Can Be. The Bernard Butler-produced four-and-a-hidden-track release is sure to whet the appetite for full-length release You And I, due early 2009. • Dundee’s finest The View are back with a new single, 5Rebbeccas, released on October 27. The raucous ripsnorter of a release is being backed up by a 35 date tour including nights at Nottingham’s Bodega and Leicester’s Charlotte. • Oddball Swedish singer songwriter Lykke Li has a new single from her album Youth Novels out on October 27. Little Bit is a hushed, breathy hit-in-waiting which could see Lykke following in the footsteps of fellow Scandanavians Robyn and Feist. • Mercury Prize-nominated folk singer songwriter Laura Marling is hoping to have a good day on October 27, when new single Night Terror is released. The former Noah And The Whale singer’s will be playing the track, plus others from debut album Alas I Cannot Swim, at gigs at Nottingham’s Rescue Rooms and Birmingham’s Glee Club during November. • You don’t have to be flush to make a deposit towards the Empty Boat cause. The international musical collective release an album, Waitless, on October 27, and every copy sold will see money donated to Pump Aid, who provide much-needed sanitation in some of the poorest countries in the world. • Four-time Grammy winner Tracy Chapman is back with a new single, album and European tour in November. Album Our Bright Future and single Sing For You are released on November 10, and the singer arrives in the UK on December 12. • If all of this is music to your ears, you can read more from the pop world online at www.echoisaacashe.blogspot.com. • UP-AND-COMING rapper Flo Rida is to release a fist-pumping new single, titled In The Ayer. The Will.I.Am collaboration, taken from the album Mail On Sunday, hits stores on September 8. • Mercury Music Prize nominees Elbow are to release a new single, The Bones Of You, on Spetmebr 29. The track, which samples George Gershwin’s Summertime, is taken from their latest album The Seldom Seen Kid. • Max Pashm, who mixes traditional Jewish, Greek and Balkan music with electronic beats, has a new album out next month. Never Mind The Balkans – Here’s Max Pashm is out on September 29 on Elektrikos Organikos Records. • Elliptical, insidious, multi-coloured and richly textured art-pop group Metronomy are set to release a new album. Nights Out, the band’s second LP, hits the shelves on September 8. • Towers Of London, the band fronted by Celebrity Big Brother contestant Donny Tourette, have announced a new album, new single, a new UK tour and new members. The group’s return begins on September 29 with the single Naked On The Dancefloor. • Mercury Music Prize nominee Laura Marling has added new dates to her UK tour. As part of the Night Terror Tour, promoting her Mercury album Alas I Cannot Swim, Laura will be visiting Nottingham Rescue Rooms on November 4 and Birmingham Glee Club on November 9. • Moby will release his new single Disco Lies on September 15. Taken from Moby’s latest album, Last Night, the new single features the vocals of Shayna Steele. • Welsh rockers the Manic Street Preachers return to the studio next month to record their ninth studio album. The LP is remoured to be the band’s darkest material since 1994’s classic The Holy Bible. • Castle Donington band Late Of The Pier have entered the album charts with their debut album, Fantasy Black Channel. The group’s new album entered the UK top 40 at number 28. • The Faff, whose lineup includes a Loughborough University architecture student on bass and vocals, have released a new single. The track, That’s A Nice Glove?, was released on August 25. • Rose Kemp’s brand new album, Unholy Majesty, is out September 1. Rocker Rose will also be touring the UK during September. • If all of this is music to your ears, you can read more from the pop world online here.